I’ve recently helped a company move their infrastructure to a new data centre. Part of this involved shutting down a large number of virtual development application servers. I don’t often shut down servers (maybe an occasional bounce after patching) so I thought about how I wanted to approach it as I wanted the process to be as quick and as painless as possible. 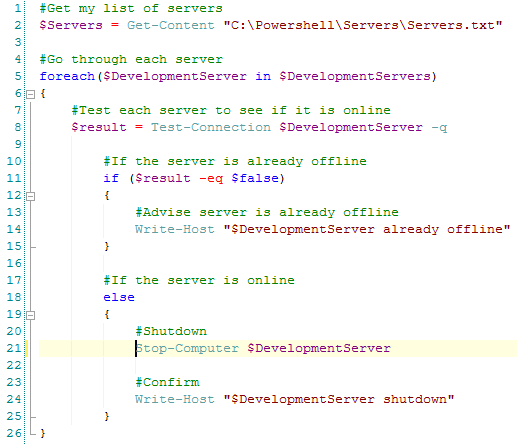 I decided that rather than go to each server individually in vCentre I used that marvelous tool, powershell (I say marvelous now, there have been times when I’ve cursed it, repeatedly). Nice and simple, and as I had over 50 servers to go through saved me a load of time! Quick note – don’t use this script for shutting down any SQL Server boxes, unless you really don’t care about the databases on them.